f) Lobules are frequently small or absent. 2. Lop ears are fairly common but in and of themselves do not constitute “CHARGE ears.” When the ear is put into the normal position, look for the distinctive CHARGE features. B.Floppy ears due to soft cartilage. Typically, the pinnae flop forward or can be bent forward too easily even after the newborn period. The reason for the apparently abnormal cartilage is not known. It does firm up somewhat over months or years but even adults may have somewhat soft pinnae. C.Reconstruction – Taping back the ears during the few months of life can partially correct a lop-ear deformity.3 Though otoplasty can serve a cosmetic purpose in older children, it has been done primarily to provide better support for behind-the-ear hearing aids and eye glasses. However, the weight of the aids may push the ear back into the preoperative position. Additional means of securing the aids should be used until the cartilage is firm enough to support the weight. D.Canals & Tympanic Membranes – Significantly stenotic canals are rare in CHARGE. TMs appear normal unless change in position or shape reflects ossicular changes or severe Eustachian tube trouble. A. Ossicular malformations – The possibility of ossicular malformations is frequently overlooked when chronic serous otitis media is present. Therefore, audiometry after PE tube placement is important. CT scan of the middle and inner ear is important in all cases where any hearing loss is present in order to rule out malformations. B. Chronic serous otitis media CSOM is common with or without accompanying cleft palate. Because of the detrimental effect any additional hearing loss has on development, do not delay PE tube placement . Significant malformations are common but much underappreciated. Early confirmation by CT scan is helpful for medical/habilitation prognosis and management. Hearing losses range from none to profound. Sensorineural loss is usually stable and aidable so management is the same as in other conditions. Cochlear implants have been done successfully and can provide at least environmental information for deafblind children. Keeping hearing aids on and working is very difficult. The reasons include not only the floppy cartilage mentioned above but also the frequent presence (90%) of impaired swallowing so that copious oronasal secretions run down the face of the supine child into the ear. The secretions may loosen the ear mold or block the air hole. In addition, the secretions may keep the canal moist setting up the conditions for chronic otitis externa. Congenital loss of vestibular function is probably the single most important factor in delayed gross motor milestones so early imaging of the inner ear is indicated.5 This will decrease the need for extensive neurologic testing and falsely low estimations of intelligence IF the implications are communicated to the primary physician and neurologist. Few tests other than tomography are available to confirm vestibular involvement in early childhood. Caloric testing may help though many children have PE tubes or TM perforations by the time this question comes up. Placing the baby in the mother’s lap in a rotatory chair and comparing their eye movements is possible only if the child does not have a significant coloboma affecting the macula (central vision). Posturography is usually not possible until middle childhood because walking is often delayed to 4-5 years, visual fixation may be impaired by the colobomas, and the child will not cooporate if he/she does not clearly understand what to do. Very little firm data is known though some suggestion of central hearing loss has been made.2 Since surrounding cranial nerves, such as VII, IX, X are clearly involved, it would make sense that the VIII nerve nuclei could be involved also. We know of no postmortem confirmation of this. IV. CAVEATS: What make CHARGE different from other syndromes? Multiple cranial nerve involvements produce many ENT concerns: olfactory, facial, glossopharyngeal and vagus nerves may be involved. Choanal stenosis/atresia, cleft lip/palate and TE fistulas may also be present. The ENT consultant is an early and very important member of the team. Dual sensory loss is present in over 3/4 of cases. Therefore, typical hearing habilitation measures may be inappropriate since they rely on good vision. INTELLIGENCE IS ROUTINELY UNDERESTIMATED in these children. Early identification of hearing and vision loss is often made without early referral to the appropriate education team, which should include educators familiar with dual sensory losses. This referral should be made as ASAP since communication is challenging to establish and yet is the key to assessing intelligence and optimizing quality of life. 2. Thelin JW and Davenport SLH: CHARGE Syndrome. Part II. Hearing loss. Int’l J of Pediat ORL 12:145-164, 1986. 3. Matsuo K, Hayashi R, et al. : Nonsurgical correction of congenital auricular deformities. Clin Plast Surg 17(2):383-95 1990. 4. Shah UK, Ohlms LA, et al. : Otologic management in children with the CHARGE association. Int’l J of Pediat ORL 44:129-147, 1998. 5. Blake KD, Davenport SLH, et al. : CHARGE Association: An update and review for the primary pediatrician. Clin Pediat 38:159-174, 1998. 6. Tellier AL, Cormier-Daire V, et al. CHARGE Syndrome: Report of 47 Cases and Review. Amer J Med Genet 76:402-409, 1998. Abnormalities of the ears, ear infections, and hearing loss are very common features in CHARGE. Together these problems can affect health and the ability to speak and learn. As with other aspects of CHARGE, not every individual has every problem. The number of problems each individual has and the severity of each problem varies greatly — within individuals and across individuals. As a result, each individual’s set of abilities and disabilities is unique. Medical care for ears and hearing in CHARGE is best provided by a physician who specializes in ears: an otologist, otolaryngologist, or ear-nose-and throat (ENT) physician. Though ear problems in childhood are often diagnosed and treated by the primary medical care provider (family physician or pediatrician), the problems in CHARGE are so complex that they need to be diagnosed by an otolaryngologist who makes an otologic (ear) diagnosis and recommends a plan of treatment to the primary care provider. Hearing is assessed by an audiologist. The results of the hearing assessment are used in the medical diagnosis of the hearing loss, in determining the success of medical/surgical treatment, and in developing an aural habilitation plan. This is a plan for overcoming hearing loss that cannot be corrected medically or surgically. It can include selection and fitting of hearing aids, speech-language evaluation/therapy, teaching of sign language, and placement in educational programs. It is very difficult to assess hearing accurately on persons with CHARGE – especially infants and young children. In some cases, detailed hearing evaluation many require many test sessions. Until hearing is assessed with confidence, it is often difficult to establish the otologic diagnosis, to select hearing aids, or to make optimal educational recommendations. Children with CHARGE need care from otolaryngologists and audiologists who specialize in the disorders of children and especially children with unusual problems. Many audiologic test facilities are not equipped to perform the types of tests needed for children with CHARGE. Selection of the appropriate otolaryngologist and audiologist is crucial to the accurate diagnosis and successful treatment of ear and hearing problems in CHARGE. 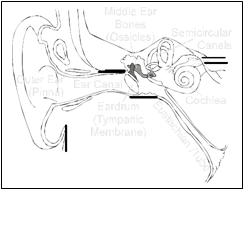 The structures of the ear are shown in the diagram to the left, and on the following page. They are described on page 3. The outer and middle ears conduct sound to the inner ear. Hearing loss due to problems in the outer or middle ears is called “CONDUCTIVE HEARING LOSS.” Conductive hearing loss only makes the sound that reaches the inner ear softer. Amplifying the sound overcomes the hearing loss by restoring loudness and clarity. Conductive loss is common in CHARGE, but it is usually only part of the total hearing loss. Pinnas can be slightly or significantly deformed. Unless the ear canal is blocked by tissue, deformities of the pinna have almost no effect on hearing. However, if a hearing aid needs to be worn, the pinna may be too soft or not large enough to accommodate a behind-the-ear hearing aid that is commonly fitted on a child. Special devices may be required to keep the hearing aid in place. In some cases, pinna shape can be improved with surgery. The ear canals in CHARGE can be narrow (stenotic). This does not usually affect hearing, but it may make it difficult to examine the eardrum and middle ear, to clean wax (cerumen) from the ear, and to fit a hearing aid earmold in the ear canal. If the ear canal is not present (atresia), it causes a large conductive hearing loss. In some cases, surgical construction of an ear canal may be attempted. The middle ear is an air-filled space behind the eardrum (tympanic membrane). Sound moves the eardrum and the three tiny bones (ossicles) which transfer the motion to the inner ear. In CHARGE, it is common to have malformed ossicles that cause significant conductive hearing loss – especially for low pitch or low frequency sounds. Usually, no attempt will be made to correct this problem with surgery. – usually with antibiotics – is needed to prevent rupture of the eardrum. Successful treatment of the infection eliminates pain but does not necessarily eliminate fluid behind the eardrum or the temporary hearing loss caused by the fluid. Pressure-equalization tubes (PE tubes) are often inserted surgically in the eardrums to temporarily overcome the problems brought on by poor Eustachian tube function. PE tubes are shaped like sewing bobbins and are a little bigger than the tip of a ball-point pen. They allow air to flow into the middle ear when the Eustachian tube will not open. They typically remain in place from several months to a year before they fall out. Many children with CHARGE require several sets of PE tubes. A marked improvement in hearing is often noted after the insertion of PE tubes. When the shape of the cochlea or the vestibular mechanism (which is joined to the cochlea) is abnormal, it may be detected using radiographic procedures (CT or MRI). However, there may be sensorineural hearing loss even though the shape of the cochlea is normal. Sensorineural hearing loss creates several problems. Sounds may not be heard unless they are amplified. However, when they are amplified, they may be distorted in a way that they cannot be understood. For example, speech may always sound muffled or garbled evenwith the best hearing aid. Lastly, there may be “loudness recruitment” in which amplified sounds become intolerably loud. In fitting hearing aids on individuals with sensorineural hearing loss, it is necessary to amplify enough so that speech may be heard but not too much so that speech and other sounds become intolerable. If either goal is not met, the hearing aid may be rejected. Abnormalities of the nerves leading from the cochlea to the brainstem and from the brainstem to the brain do not cause hearing loss in the conventional sense. If a person had this type of loss, they may have normal hearing thresholds but a poor ability to understand speech under any conditions and especially in background noise. These are problems that receive audiologic and educational treatment rather than medical or surgical treatment. When both conductive and sensorineural hearing loss is present, the loss is called “MIXED HEARING LOSS.” This is the most common type of hearing loss in CHARGE. It is usually composed of permanent conductive loss due to malformation of the ossicles, fluctuating conductive loss due to the intermittent presence of fluid in the middle ear, and sensorineural hearing loss that usually was present at birth. In general, the conductive losses are greatest for the low frequencies and the sensorineural losses are greatest for the high frequencies. 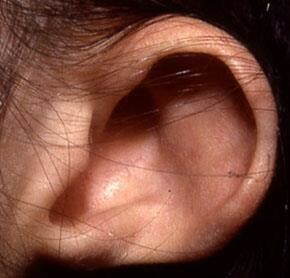 Often there is marked asymmetry in hearing between the two ears. Progressive hearing loss (conductive and/or sensorineural) is an uncommon finding n CHARGE, but has been reported. However, there is probably insufficient audiological documentation over time on a group of children to reach a good conclusion. In cases where the loss has progressed, it has usually been a small increase superimposed on a large existing loss. As the child matures and communication improves, behavioral hearing thresholds often improve slightly because of the child’s improved ability to concentrate or to perform the listening task, rather than a change in hearing. Thresholds obtained with ABR (BAER) tests should not improve markedly with maturation. The most important information to be obtained in an audiologic evaluation is the determination of the thresholds of hearing for specific frequencies for the two ears measured independently. The information is recorded on a form called the “AUDIOGRAM.” An example of an audiogram is shown in Figure 1 (next page). The thresholds of hearing can be measured in behavioral tests in which the individual is required to give an active response to sound or using an auditory brainstem response (ABR) test which requires that the person be asleep or sedated. Usually, attempts are made to obtain responses to pure-tone signals over a range of test frequencies that is important for understanding speech (500, 1000, 2000, and sometimes 4000 Hz). This information is very important to the otologic diagnosis and the decisions related to hearing aids. Other tests may be done, but this is the most important. The audiologic evaluation process should be repeated until there is confidence in the pure-tone hearing thresholds that have been measured. This is a test of the mobility of the eardrum and middle ear. It requires only that a child sit still for a short period of time, and it does an excellent job of detecting the presence of Eustachian tube dysfunction and fluid in the middle ear. This test is used regularly in the management of middle-ear disease – however, it is not a test of hearing. “TYMPANOGRAMS” give information about the middle ear and not the overall ability to hear. The aural habilitation program needs to be managed by a professional who is in constant contact with the child with CHARGE. This may be an audiologist associated with the treating otolaryngologist or a professional associated with the educational system (audiologist, speech- language pathologist, special educator, teacher, etc.). If there is a significant hearing loss, the educational progress needs to be monitored closely and the amplification system needs to be checked daily. When the hearing has been measured adequately, hearing aids need to be selected and fitted by the audiologist. It is important to remember that the sole purpose of hearing aids is to improve hearing, and that the aids have little value if they do not achieve that goal. In children with CHARGE, this is very difficult to achieve but it is the goal. The hearing aids must stay on the head, the ear molds must not hurt or irritate the ear canals, there must be adequate amplification but not overpower the child, and the frequencies amplified must improve the ability to understand speech. In addition to hearing aids, there are amplification devices called assistive listening devices or auditory trainers. These devices have a microphone that is located close to the talker so that the listener has a better chance to hear. Assistive listening devices are valuable when there is background noise – especially in classrooms. The type(s) of hearing aids selected will depend on a large number of factors. In-the-ear (ITE) aids are usually not appropriate for children. Behind-the-ear (BTE) aids are often chosen because they have power and flexibility. Body-worn aids are also considered if the hearing loss is very large. Cochlear implants are surgically implanted devices that bypass the cochlea and electrically stimulate the nerves directly; they are only considered when the losses are in the severe to profound category. If there is any measurable benefit from hearing aids, it is unlikely that cochlear implant surgery would be performed. There are strict FDA guidelines for who may be considered for implantation. Very few children with CHARGE have received cochlear implants. For many children with CHARGE, the first years of life are spent treating life-threatening problems. After this period the parents have the chance to focus on development and education. It is important to note that most children with CHARGE pass through critical developmental periods for the development of speech and language in a state of sensory deprivation. Usually there have been significant hearing and vision problems regardless of attempts to overcome them. As a result the child with CHARGE begins the educational process at a disadvantage. In whatever educational setting, a child with CHARGE is placed, there needs to be a coordinated effort of all the professionals who have knowledge of the child’s abilities and disabilities to ensure success.